Revolutionary responsiveness. 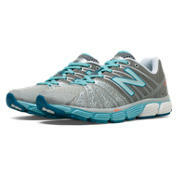 The 890v5 combines a REVlite midsole with an ABZORB crash pad for supreme comfort and impact protection. But with the FantomFit, Ortholite® sock liner and no-sew overlays, this shoe is incredibly light—so you can feel incredibly fast. Sizes:(2A) 5-12 (B) 5-11,12 (D) 5-11,12 (2E) 5-11,12 * sizes available although not all in stock.